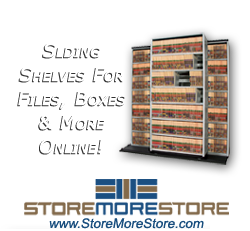 HD Files provides Compact Shelving Filing Systems for businesses and organizations in Texas, Oklahoma, Arkansas, Mississippi, Tennessee, and Kansas. Compact shelving , storage, cabinets, and filing systems are manufactured by Spacesaver . Spacesaver does exactly what the name implies – saves space. Spacesaver is the industry leader in mobile and high-density filing storage systems. Spacesaver can be used to store virtually anything. Any item that is stored on a shelf, rack, pallet, bin, drawer, or tray can be mobilized in compact shelving. Spacesaver high-density mobile storage and filing systems consist of shelving, cabinets, drawers or racks mounted on wheeled carriage tracks. Individual modules compact together to eliminate the need for multiple access aisles and thus, reduce the amount of space required for storage. This provides enormous savings in construction and rental costs. Spacesaver steel shelving systems include 4-Post shelving for institutional and industrial use, and cantilever designs shelving for use in libraries. Spacesaver rotary storage systems include both pre-configured and customized units. Spacesaver Mobile Art Rack Systems preserves floor space as well as framed artwork.